Tess is the co-producer of The Summons podcast, a student run podcast at Melbourne Law School. “When I started the JD, creating a podcast was the last thing I thought I would be doing during my time at MLS,” she says. According to Tess, the idea to a start a podcast largely came about by accident. “During our first semester my good friend, Camille Bentley McGoldrick, and I bonded over our mutual love of podcasts. Half-joking, we talked about making our own,” she says. The opportunity to engage with legal experts and discuss topical legal issues was what motivated the pair to make their podcasting aspirations a reality. “We both had the feeling that there were so many distinguished legal professionals associated with the law school who we wanted hear from,” she says. When deciding on the name of the podcast, Tess drew inspiration from the work of previous MLS students. “After scouring the University of Melbourne’s archives we settled on The Summons as the name of our podcast,” she says. The Summons was the name of the first magazine published by the students of Melbourne Law School between 1891 and 1903. “We loved the name and thought it was a great link to the history of MLS,” she says. For Tess, starting a podcast came with its own challenges. “I remember feeling like I had no idea what I was doing during our first interview,” she says. 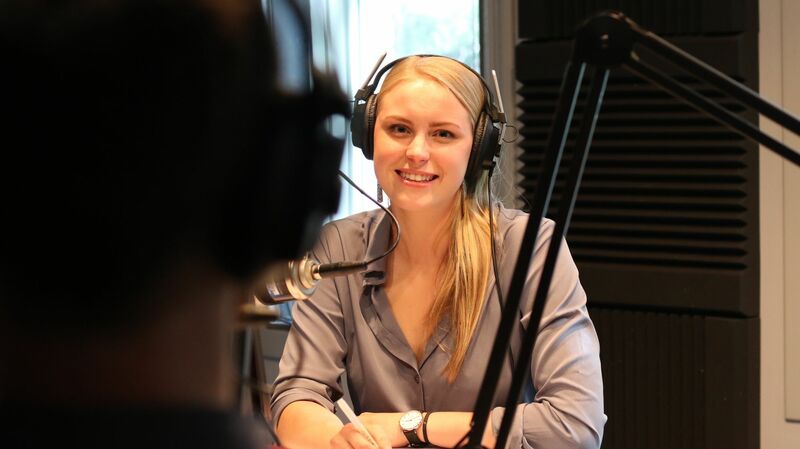 Podcasting has allowed Tess to develop skills in a number of areas, from learning to use audio equipment and editing software to interviewing former High Court judges.